You asked and we delivered! Our new and improved design center now has the option to add up to FIVE pieces of art on each side of your tee! Plus, you can now outline text AND add different styles of text to each side! 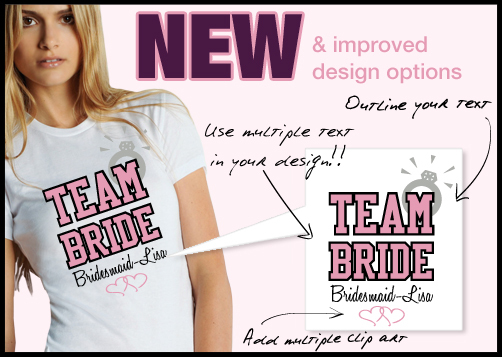 Oh yeah, almost forgot: the new TEAM feature allows you to design the backs of your TEAM BRIDE tees with ease! Go and check it out because I KNOW I am forgetting something else! Hey Guys! We’ve decided to dedicate a weekly post to the current and active promo codes for Bridal Party Tees. There are a lot of coupon sites out there promoting our coupons and discounts but a lot of what you’ll find are expired or incorrect. So, if you are searching for BridalPartyTees.com promo codes or coupons, you’re in the right place! Below you will find the most current coupons and offers with the satisfaction of knowing they’ll work! BPT222: 20% off your entire order! Valid through 02/28/2011. Get designing! BPT215: $20 off your order of $100 or more Valid through 02/23/2011. Get designing! BPT28: FREE Junior Fit or Misses Relaxed Basic Tee with $60 order Valid through 02/16/2011. Get designing customizing! BPT21: NEW DESIGN CENTER! $10 off your order of $20 Valid through 02/07/2011. Check out the new design center and let us know what you think customizing!